“Solus Christus” Jesus Christ alone gives salvation and access to God the Father. “Sola Gratia” We are saved by grace alone, apart from any human merit. “Sola Fide” Salvation is received through faith alone, apart from any human works. “Sola Scriptura” The Bible alone is our authority in faith and practice. “Soli Deo Gloria” The goal of the Gospel is that everything give glory to God alone. 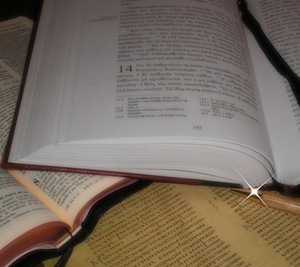 We believe that the Bible is the Word of God, supernaturally inspired both as a whole and in its individual words, inerrant in its original manuscripts, and preserved by God so that it is the divinely authoritative standard for all people in every age and every aspect of life (2 Timothy 3:16; Matthew 5:18). We believe that God exists eternally in three persons—Father, Son, and Holy Spirit —and that these three are one God (Deuteronomy 6:4; Matthew 3:16-17, 28:19). We believe that He is the absolute and sole Creator of the universe, and that He created out of nothing, by His word (Genesis 1; John 1:1-3; Hebrews 11:3). We believe that man did not come about through evolution, but was specially created in the image of God, that he disobeyed God and thereby incurred spiritual death, which is separation from God, and also physical death as a consequence; and that all the Adamic race are sinners by nature and practice (Genesis 1:26–27; Romans 5:12–19; 7:15–21). We believe that God, by His sovereign choice and out of His love for men, sent Christ into the world to save sinners (Romans 5:8; John 3:16). We believe that Jesus Christ was both fully God and fully man, that He was born of a virgin and lived a sinless life, in which He taught and wrought mighty signs, wonders, and works as revealed in the four Gospels. He was crucified and died to pay the price for our sins, and was raised bodily from the dead on the third day. He presently sits exalted at the Father’s right hand, where He is head of the church and intercedes for believers (John 1:1, 14; 14:3; 20:30-31; 2 Corinthians 5:21; Colossians 1:18). We believe that, since the shed blood of Christ’s death made a perfect atonement for sin, redeeming us from the curse of the law by becoming a curse for us, men are justified and saved solely on the ground of Christ’s shed blood (Galatians 3:13; Romans 5:9). We believe that salvation, with its forgiveness of sins, its impartation of a new nature, and its assurance of eternal life, is received by faith in Christ alone, entirely apart from good works, baptism, church membership, or any other effort of man. It is a pure work of God’s grace (Ephesians 2:8-9). We believe that one who has put faith in Christ is sealed by the Holy Spirit (Eph. 1:13-14), and is eternally secure, unable to be sundered from God’s love and lose his or her salvation (John 10:28-29; Romans 8:38-39), but that sin can interrupt the joy of his fellowship with God and bring the loving discipline of his Heavenly Father (1 John 1:6-7; Hebrews 12:6). We also believe that, when a believer does not build on the foundation of Christ, he will lose rewards at the judgment, but he remains saved, though “as by fire” (1 Corinthians 3:10-15). We believe that the Holy Spirit is a person, is God, and possesses all the divine attributes. He indwells every believer, baptizes and seals all believers at the moment of salvation, gifts every believer for service, and fills them in response to confession of sin and yieldedness (Ephesians 1:13; 1 Corinthians 12:13; Ephesians 5:18-19). Those who walk in the Spirit will not fulfill the desires of the flesh and will exhibit Christlike character as spiritual fruit (Galatians 5:16, 22-23). We believe that God is the source of all true pleasure and delight (Psalm 16:11) and worthy of our wholehearted love (Deuteronomy. 6:5). It should be the goal of every Christian to walk victoriously in that love, issuing in good works in every sphere of life and society, and to grow in spiritual maturity through obedience to the Word of God and the indwelling Holy Spirit (Ephesians 2:10, 4:13; 2 Timothy 2:15-16; James 1:21-22 ). We believe that every believer is called to preach the Gospel and make disciples, baptizing and teaching them to follow Christ’s commands (Matthew 28:18-20; Mark 16:15; Acts 1:8). We believe the Church is an elect company of believers baptized by the Holy Spirit into one body; its mission is to witness concerning its head, Jesus Christ, preaching the Gospel among all nations (Ephesians 1:3–4; 1 Corinthians 12:13; Acts 1:8), and building up believers in spiritual maturity (Ephesians 4:11-14), Believers who are not actively involved in the church suffer spiritually (Hebrews 10:24-25). We believe that every believer has been gifted by God to minister in and through the church (1 Corinthians 12). We believe that the Holy Spirit indwells, seals, and gives spiritual gifts to every believer; and that He guides, fills, teaches, and enables every believer to do the will of God as the believer trusts and obeys the Spirit (Romans 8:9; Ephesians 4:30; 1 Corinthians 12:7–11; Galatians 5:16–18; Ephesians 5:18; 1 John 2:27). We believe that water baptism and the Lord’s Supper are the ordinances of the Church in this age (1 Corinthians 11:23–26; Acts 2:41). We believe that the Lord’s Table should be open to all baptized believers who choose to partake, whether or not their theology of the Table agrees with ours, as long as they are not under just discipline from some church. We believe that, while water baptism is not part of the Gospel (1 Corinthians 1:17), and therefore not necessary for salvation, it is God’s will that every believer be baptized (Matthew 28:19-20), and that both the meaning of the Greek word baptizo and the example of Scripture confirm that the mode of baptism is immersion. Furthermore, there is no Scriptural warrant for the baptism of infants who have not reached the age where they can come to Christ in comprehending faith. However, we realize that there are many faithful believers who are convinced from their study of Scripture of the validity of infant baptism. Therefore, since Scripture says there is but “one baptism” (Eph. 4:5), we will not require an adult baptism of such a person against their conscience, until they become convinced of the contrary. We believe that Christ will return to Earth visibly, bodily, and personally to defeat the forces of Satan and consummate His kingdom, and that the lost dead will be condemned eternally according to their works, while believers will live forever as the Bride of Christ (Revelation 19-22).